How long does Taurus sc last as a barrier around the foundation of a house? The active ingredient in Taurus SC is Fipronyl. I am not aware of any studies that show how long Taurus SC lasts, but there are studies that show Termidor SC (also Fipronyl), lasting 15+ years. However, I don't think you can say that Taurus SC will last this long, since the Fipronyl in these 2 products is from different sources. I have heard that Fipronyl contained in Termidor SC is made in the USA, and that Fipronyl contained in Taurus SC is made in China. I cannot document this, but this what I have heard. 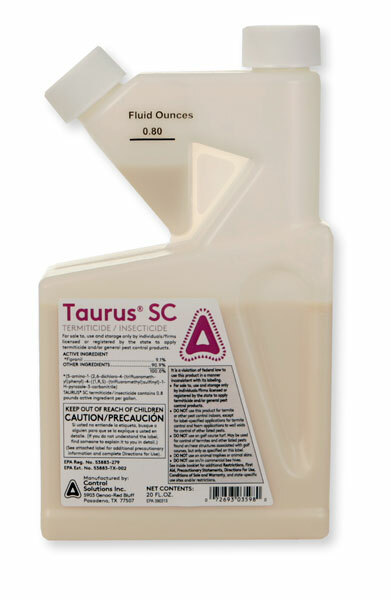 Our customers that have purchased Taurus SC do not have any major complaints, the only thing I have heard is that the Taurus SC product seems to have a slightly different and stronger odor than Termidor SC.